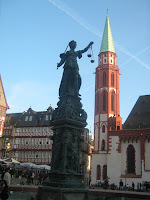 Last Sunday I was in Frankfurt. It's a beautiful city, centred around the lovely river where green walkways and leafy trees line the banks. The local citizenry spend their Sunday afternoon strolling, dog-walking, biking, fishing, dangling feet over the wall, and just walking along the riverside. 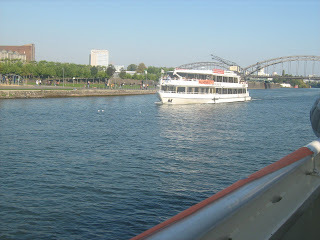 Some people, including the odd tourist, such as one from Moldova, go sailing down the river on a cruise boat. It was sunny and beautiful with a nice breeze ruffling my hair and the sun shining down warmly. 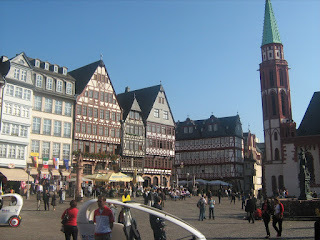 Later, I enjoyed strolling through the historic centre square, enjoying buskers and just seeing all the people enjoying themselves. Posted by Barb at 11:26 p.m.